Performance-based contracts often include a Scope of Work as well as a Performance Work Statement. These important documents serve as your checklist of what you and your client are agreeing to deliver to fulfill your contract. So often, small business and freelancers submit informal proposal that lack a clear description of precisely what clients will get for their money. Think of your Scope of Work as the ingredients and the Performance Work Statement as the recipe. The Performance Work Statement should contain the desired outcomes, the metrics by which successful performance of the contract is measured, and a quality rubric to maintain quality standards. 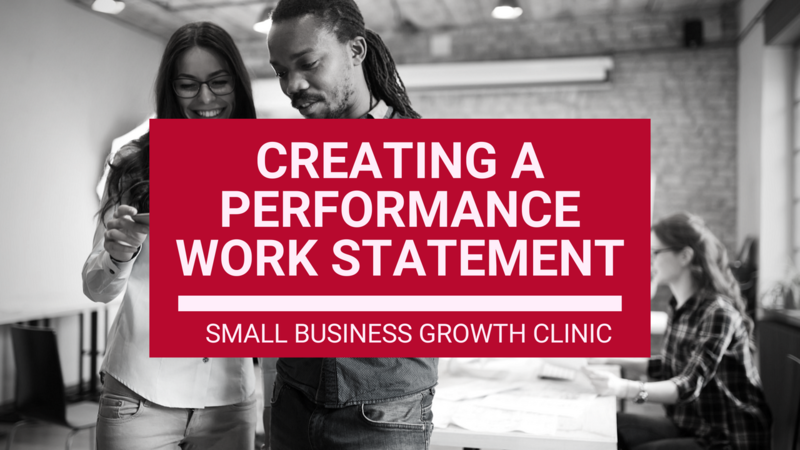 At the end of this clinic, you will have a Performance Work Statement. This clinic is a live, one-day training that is available onsite, live stream or via webinar replay. Those who attend the on-site training will be provided a boxed lunch. Of course, if you choose to register for the webinar, you will not have the opportunity to ask questions. Keep an eye on your inbox to find out when the next Performance Work Statement Clinic will be.